oday’s dynamic agricultural industry demands flexibility, creativity, and critical thinking skills more than ever before. We provide excellent learning opportunities across a broad spectrum of capabilities, and our graduates are finding work in many different fields. First and foremost is undergraduate and graduate education of students on campus. Our faculty brings a fresh approach to relating economic thinking to relevant problems. Second is educational outreach to the people and communities of the state. We provide resources and insight to communities, leaders and citizens. Third is solving problems in agricultural and rural economies through our research. Our research aims are grounded in solving practical applications – whether they be in managing the environment, working in private industry or helping government. The AgEcon Department strives to apply sound decision-making principles to agricultural and other natural resource-based ventures and to the development of our communities. Our researchers are top educators who work in the areas of firm profitability, market performance, environmental quality, natural resource use, and government policy. 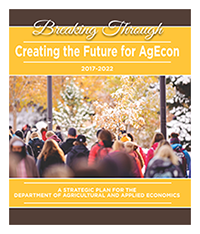 Breaking Through - Creating the Future for AgEcon, is our plan to even more effectively serve our students, the people of Wyoming and the region, and the scientific community over the next five years. With the support of the University and COANR, and our alumni, industry partners and friends, we will continue to uphold the land-grant tradition for decades to come. Students - the Reason We're Here!